Note the designation “no Bigsby” on a couple of 355’s in the left column. We know you’re out there. We just have to find you. Not long ago I acquired and later sold what I considered to be a true holy grail guitar. 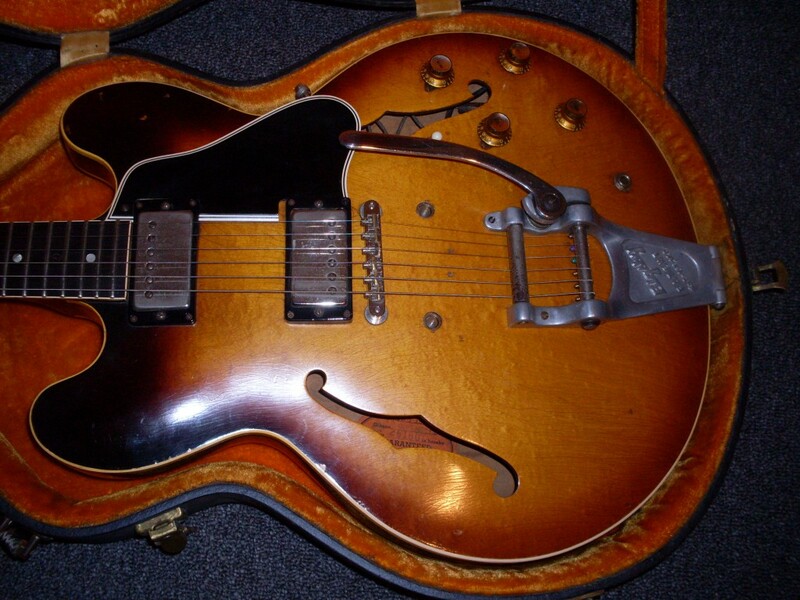 It was a 59 mono ES-355 with a factory stop tail. At the time, it was the only one that anyone had ever seen. Gil Southworth had it for awhile and not long after he sold it, I was offered it. Although it looked pretty good, it was purported to have a shaved neck. It blacklighted well but I took Gil’s word for it but I wonder if it was simply the fact that 355 necks even in 59 can be quite slim. There are a few out there with huge necks mostly with 58 serials or FONs. I have one in my shop right now with a neck as big as any 335 I’ve ever had but that one has, as usual, a Bigsby. The 59 stop tail 355 is gone and my eyes were open for another. 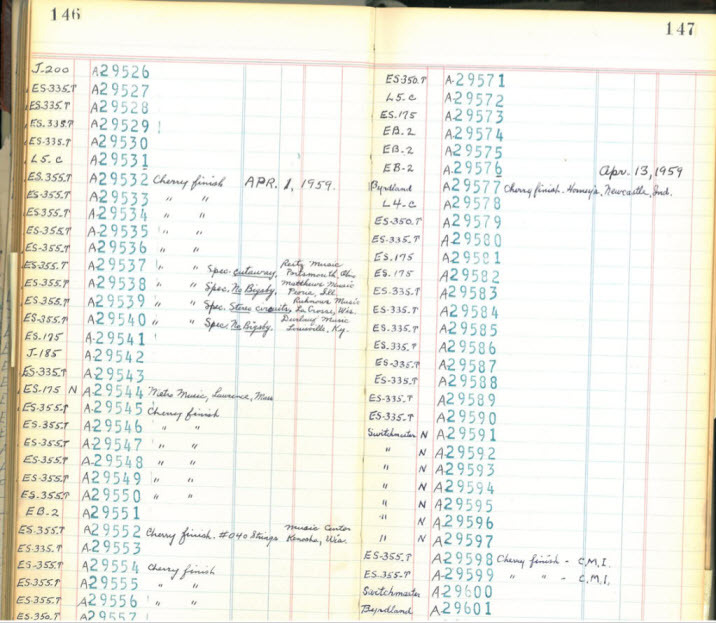 I had seen the above page of the 59 shipping log that showed two other 355’s with “Spec. no Bigsby” noted. Neither of these was the one I had, so I knew there were two more stop tail 59’s out there somewhere unless, in a horrific case of irony, someone later added a Bigsby (stranger things have happened). I didn’t know if they were mono or stereo from the log but it didn’t really matter since neither had surfaced. I used to think the chances of a particular special guitar coming up for sale that I had seen in the shipping log was pretty slim but after snagging three black 59 345’s last year, I’ve reconsidered. I think, eventually, most all of them come up for sale. 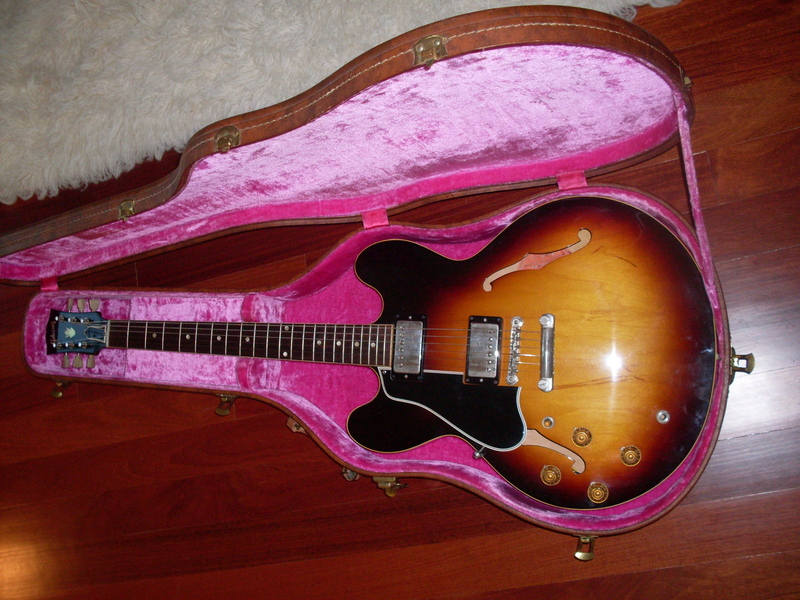 Well, a few weeks ago, a Craigslist ad appeared for a “58 ES-355” and I saw it within an hour of its posting. An astute reader of this blog tipped me off to it but I was already on the phone with the owner. It turns out that serial number A29538 was a little bit south of Saskatoon, in Assiniboia, Saskatchewan and it belonged to the seller’s aunt (who was a singer and player) and she had passed away and the guitar was coming to him as an inheritance. It also turns out to be not a 58 but a mono 59 355, so I was pretty excited. There is often a problem with individual sellers and that is that they look at dealer prices and assume they are what the dealers get and the sellers initial asking price was “six figures”. Yikes. It’s pretty easy to understand, though. A 355 looks pretty much like a 335 to anyone who isn’t really tuned into the models and the asking 335 prices for a 59 are up there, although “six figures” is reserved for mint blondes. I explained to him that a stop tail 355 is super rare and that his guitar commands a considerable premium over the Bigsby version and we came to a agreement on price about as far North of a Bigsby mono 59 as Saskatchewan is from Connecticut. Yes, it’s really, really rare but the market is much smaller for 355’s. Folks who can afford it, want a 335. But a mono stop tail? Well, now that’s a fancypants 59 335 with an ebony board. And some serious cachet. I don’t have it in my hands yet but my friend Mike in British Columbia went through it for me and gave it the thumbs up, so it’s on its way. Remember the old rule I have about falling in love with a guitar. Well, I’d better embroider a pillow with it because it’s about to get tested again. I thought it was tough to sell the black 345’s but this? Even rarer and even cooler if you ask me. Now where is A29540? And that cherry Byrdland in the next column would be pretty cool too. Yes, it has a correct case but it was shipped in this one. It had to get from Assiniboia Saskatchewan to Nanaimo, British Columbia in the dead of Winter in a snowstorm. It took awhile but it arrived safely. How cool is this? Here’s the lineup. That’s the 2014 in front with the 69 behind it. Then the 64, 65 trap. 58, 65 stop, the 62 and the 60. A 345 and a couple of 355’s are lurking in the back. Things get a little slow at OK Guitars during the month of March in Kent, CT. Kent is a tourist town and it appeals mostly to outdoorsy types who hike the Appalachian Trail which passes along the ridge a mile or so from my shop. It also appeals to families who visit Kent Falls to the North of me. So, given how terrible the weather usually is around here in March and the snow that still covers most everything and the mud and the depressing lack of sunshine, it’s no wonder things have been a little slow at OK Guitars. What to do on a rainy, windy Saturday? Play some guitars. Tone is subjective. What I like isn’t necessarily going to be what you like. So, if I play every 335 in my shop and rank them according to tone, I’m really just giving you my opinion. But certain aspects of an electric guitar are pretty universal. Most everyone wants a guitar that is balanced, that sustains well, that has a decent tonal range and is comfortable to play. Well, if they’re all 335’s, how much variation is there going to be? I kind of expected quite a lot. I was surprised. Here’s what’s on the wall in 335’s. We’ve got a 58, a 60, a 62, a 64, two 65’s, a 69 and a 2014. All stop tails except the 64 (Bigsby), one of the 65’s (trap) and the 69 (trap). All of them are set up to my preferred specs. Pickups close to the strings, action medium, 11’s and, for the stop tail, the tailpiece screwed 80-85% of the way down so the break angle is fairly steep. Obviously, I can’t do that with the Bigsby and the traps. But we’ll let the chips fall where they may. First up was the 58. Big fat neck, shallow neck angle, thin top and a killer set of PAFs. It’s no wonder this bad boy performed at the top of the pack. Singing sustain, searing highs, tons of harmonics, no fretting out and big range. This is as good as a 335 gets. But then, because I expected something wildly different, I picked up the 65 trap tail. Big neck but later patents (chrome covers usually indicate poly windings), fairly steep neck angle and the thicker top of a post 58 335. If I rate the 58 a 99, this guitar, trap tail and all gets a 96. It was a little heavy for a 335 at around 8.5 lbs (the 58 was a pound lighter) but this guitar performed brilliantly. Lots of tonal range, great sustain, easy playability and great tonal and volume balance between the pickups. As I’ve said before, the stop tail makes a difference but not a huge difference. Right there with the trap 65 was the stop 65, the 60 and the 62. 62’s are vastly underrated mostly because of the thinner neck profile but most of the 62’s I’ve had are wonderful players. The major difference between the 60 and the 62 and the stop tail 65 was neck profile. The pickups (nickel covers in this 65) are the same, although the 60 and the 62 had PAFs and the 65 patents and the configuration is the same except the 65 had nylon saddles and the 60 and 62 had metal. Almost no difference in sustain between the three. I think the 62, on the subjective side, had a sweeter sounding neck pickup but the 65 had that chainsaw of a bridge pickup that I like so much. The 60 was the best balanced but the 65 and the 62 were really close. Still, these five guitars were just killer. I’d play any one of them for the rest of my life and be happy. Next up was the 64 Bigsby which was tonally awesome but didn’t have the crispness and touch articulation of the stops or the 65 trap. I think the Bigsby could be the culprit. The good news is that it has stop tail bushings and had I more time, I would have strung it up with a stop to see how much of difference it makes. So, that’ll be another post. Still, excellent balance, great sounding pickups with lots of harmonics and great range. You gotta love the neck on a 64/early 65. Fairly slim at the first fret, these necks get real big real fast. No wonder 64’s are the most popular 335 out there. So that leaves two more to play…the 69 (which is rewired 340) and the 2014 Memphis VOS 59 reissue. The 69 has a maple neck with a huge profile but a narrow nut. The narrow nut is a generally playability problem for me but after 10 minutes, I found it fairly comfortable and I wasn’t falling all over myself trying to play it. The maple neck and Indian rosewood board make no discernible difference. The pickups are late patent numbers but are likely pre T-tops. Unusual for a 69 but not unheard of. The sustain was quite good as was the tonal range. The balance was lacking but I could probably dial it in-the neck pickup was too loud and a little muddy. A pretty nice guitar especially for the price. And a good looker too in blonde. Yes, it’s birch rather than maple and looks a little like your kitchen cabinets but they’re nice kitchen cabinets. Last up was the 2014. It looks great and feels really good to play. The shoulders on the 59 sized neck are big and it makes me feel a little clumsy (actually I am a little clumsy but this was worse than usual). You might like that. I don’t. Sustain wasn’t quite there and I really don’t know why. I can only blame the wood. Too wet? Too new? The frets were good-it’s essentially a new guitar. This has been my complaint about new Gibsons. They’ve got the look pretty close to vintage (except the guard and the pickup covers), they’ve got the feel pretty close to vintage but they simply don’t sound vintage. My thought is that the 58 probably sounded a lot like the 2014 when it was new. I will re-do the test in around 60 years and see how the 2014 does. I’ll be 124 but by then I should be a pretty decent player by then if I keep practicing. Mint but how do I know that none of the parts have been changed? Do I have to take someone’s word for it or is there a way to tell? I mean don’t all vintage parts look pretty much the same? No, the photo isn’t backwards, it’s a mint 58 lefty thanks to Alex P.
In the last post, I discussed three elements-uh, let’s see, there was tone, there was playability and there was one more. Oh, yeah, the Department of Energy. No, that was Rick Perry. It was great looks. The fourth element worthy of some discussion is originality. 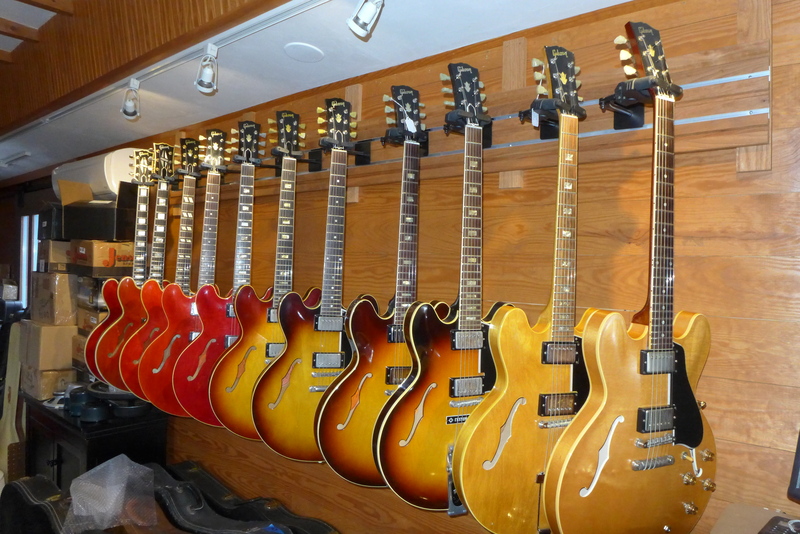 For the collector, it’s really important-to some more so than playability or tone. But there are some paradoxes when it comes to originality that probably drive collectors nuts. First, there is a limit. I did have a 66 Stratocaster come into my shop from the original owner who tried to play it for a month when he was a kid (now in his 60’s) that still had five of its original strings. Apparently, he got discouraged when he broke the E string and never played it again. But, as the title of the post implies, I don’t care about the strings. And, to be fair, collectors don’t care either. It’s kind of cool that 50 year old guitars exist that still have their original strings but seriously, nobody cares. It’s like buying a classic automobile that still has it’s first tank of gas in it. The gas will be about as good as those strings. Beyond the original strings, there is room for debate. Some stuff, I care about. Some stuff I don’t. Here’s the tricky part. You can’t know for absolutely certain that any removable part is original. Oh yeah?, you say-what if it’s the original owner and he knows he never changed any parts? Well, that will give you a fair level of assurance except when he brought it to his local luthier for a setup and the unscrupulous luthier scavenged the PAFs and replaced them with fakes. 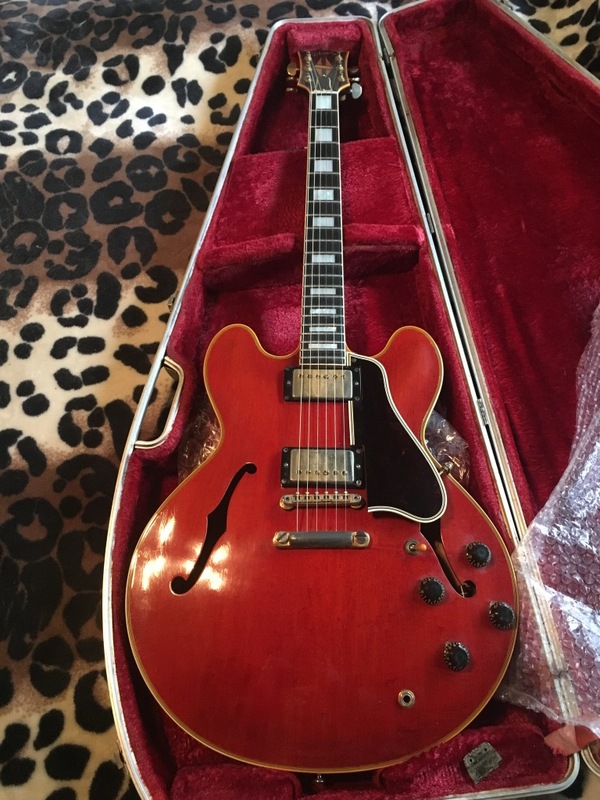 It happened to a 60 ES-345 I bought from its original owner in North Carolina a few years back. When I buy a guitar that is supposedly all original, I look at a few things. First, I check to see if all the parts are from the correct era. That’s easy. It won’t tell me if the part is original but if it’s vintage correct, I don’t really care because you simply can’t know for sure. But then I look at the wear pattern on the guitar. If the body is beat to hell but the gold is still on the tailpiece, an alarm goes off in my head. If the hardware is perfect and the neck has heavy player wear, there’s that alarm again. This type of forensics is really useful and generally follows simple logic. The guitar and all it parts should make sense as a used guitar. The less wear the guitar has, the easier it is to make the assumption of originality. That’s simply because there’s less evidence that tells you something is wrong. Counter intuitive, right? Sort of. But it’s harder to find a mint part than a worn part, so it makes sense. Frets are a great indicator of a few things . If they are original and not worn much, the guitar probably either didn’t get played much or had flat wounds on it. It doesn’t tell me much about the rest of the guitar though. I do not care if a guitar is re-fretted as long as it’s done well. A serious collector will care and I understand that. If I’m looking for my holy grail guitar (59 stop tail 355 mono in black? ), I won’t care about the frets (or much else). And that’s an important element. The real serious collectible and valuable ES models are often rare. Even the “common” ones are pretty rare in the over all scheme of things with hundreds, not thousands made. I had a buyer looking for a 59 mono big neck 355 the other day. I had a good one but it had been re-fretted and he decided to wait for one that wasn’t. Any big neck 355 is rare, monos more so. I hope he’s a patient man. There are probably less than 50 of them. So, what else don’t I care about? Tuner tips on a 59-most are shrunken and if they are replaced, it isn’t a big deal to me. Saddles. Again, if they are correct, I don’t care (they should have the mill marks on the flat side). Saddles got lost all the time with a no wire bridge. Any part that is removable without evidence of it having been removed has to be vintage correct and have a wear pattern that makes sense. Otherwise I care. Use common sense and logic. If a part looks wrong for the guitar its on, it probably is wrong. Even if you know its vintage correct. So, if you’re a collector looking for the most original guitar you can find, learn what’s correct and apply some simple forensics. You’ll be more comfortable with your choice and you’ll probably be right. Buying from a reputable dealer who knows his stuff will probably reassure you as well. As the old Russian proverb goes, Doveryai, no proveryai (trust but verify). And you thought President Reagan came up with that. Maybe I’m better off paying way less for a great playing, great sounding player grade guitar. Then I won’t care so much about originality. I’ll spend less and know I’m getting a guitar that I can use day in and day out. Originality? Who cares as long as I love it.